We provide secure commercial storage solutions for all your business storage needs. Whether your business is expanding or downsizing, overstocked or overflowing; wasted space is wasted money! What do other businesses store with us at Peaks Storehouse? Excess paperwork that needs archiving; excess stock; office furniture; seasonal promotional material. Whatever you want to store, we have room for it. Peaks Storehouse offers the perfect commercial storage solution for all businesses looking to maximise their space. No need to pay for extra, expensive commercial property, we have space available NOW. Storage terms are flexible with one monthly invoice and no long term contracts. You can store your goods for a as long or short a period as you require. The price quoted is the price you pay and includes all bills, service charges and rates. 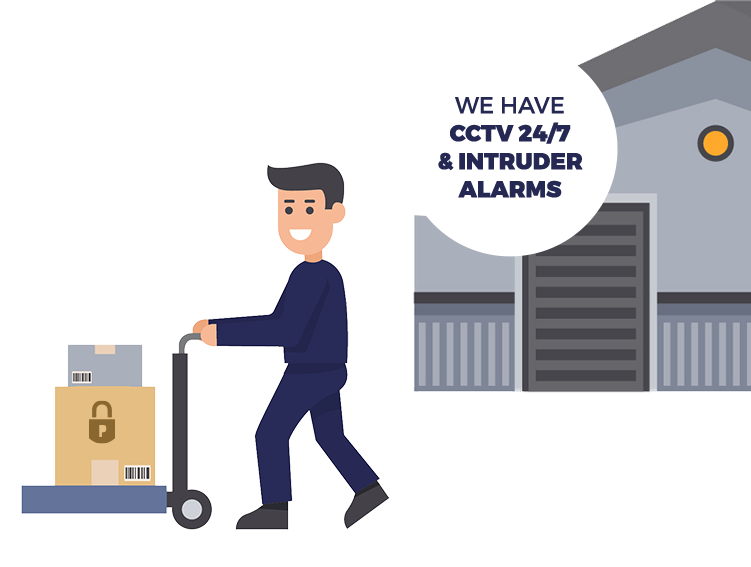 The storage facility is covered by a state-of-the-art CCTV system. We've invested in round the clock security and safety equipment. A system is in place to protect the integrity of the storage complex out of hours. There is always fully trained members of staff on site during office hours. Constantly upgraded alarms and smoke detectors are fitted throughout the building. The security of your goods is of paramount importance to us. Simple rental agreement - you pay either weekly or monthly and only have to give 7 day's notice if you wish to vacate. Free use of pallets, trolleys and experienced forklift truck drivers to help with larger items. Free access as often as you like during office hours and pre-arranged extended hours access. Specialist advisers offering a personal service. Ideal location close to the centre of Cambridge. Customer goods lift and wide corridors for easy manoeuvrability. No utility bills or rates to pay. PRICE PROMISE - we promise not to increase your price for the duration of your storage.